Superfood or not, ghee or toop, as we call it in Marathi, is loved by one and all in my family. Its fragrant aroma, especially when served with dal and hot rice is heavenly! None of the top brands of ghee available on the market can ever match the flavour of home-made ghee. 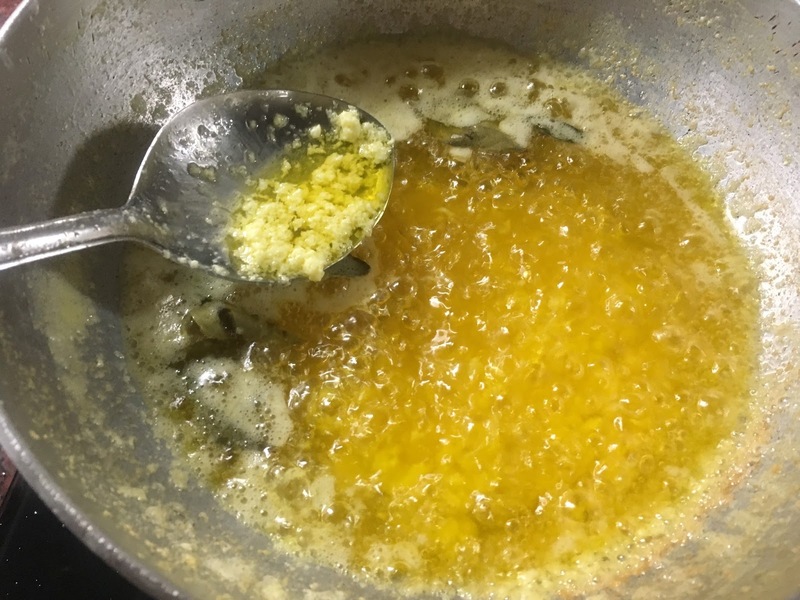 Yet, early on, I was always intimidated to make ghee at home. The process seemed a lengthy one and definitely beyond me. I always used to use store-bought ghee and sometimes the ghee sent over by my relatives. I also used to buy the tetra-pack milk for a long time and there was no cream whatsoever to churn and make ghee. Hence, I never tried my hand at making ghee until recently. 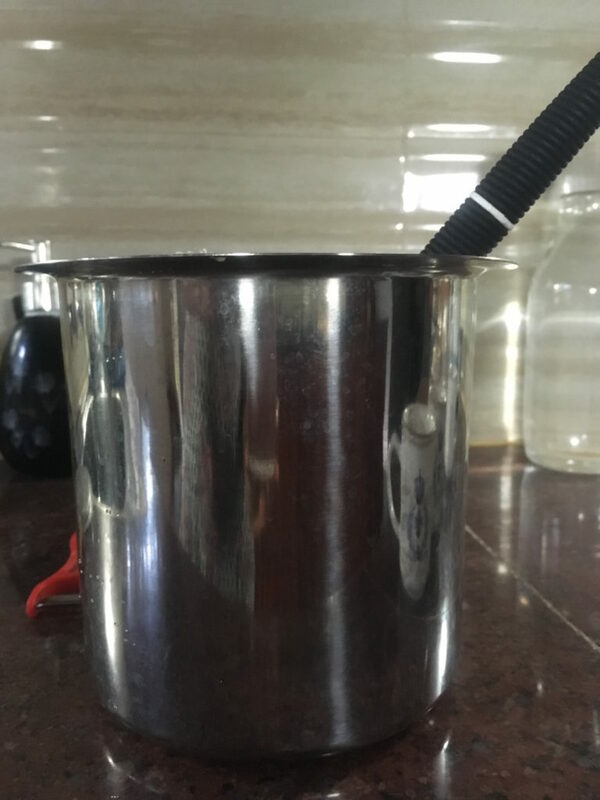 However, just a few months ago, I switched to buying cow's full-cream milk (Nandini's 4.5% full-fat cream milk available in Bangalore) and this is when I decided to try making ghee at home. 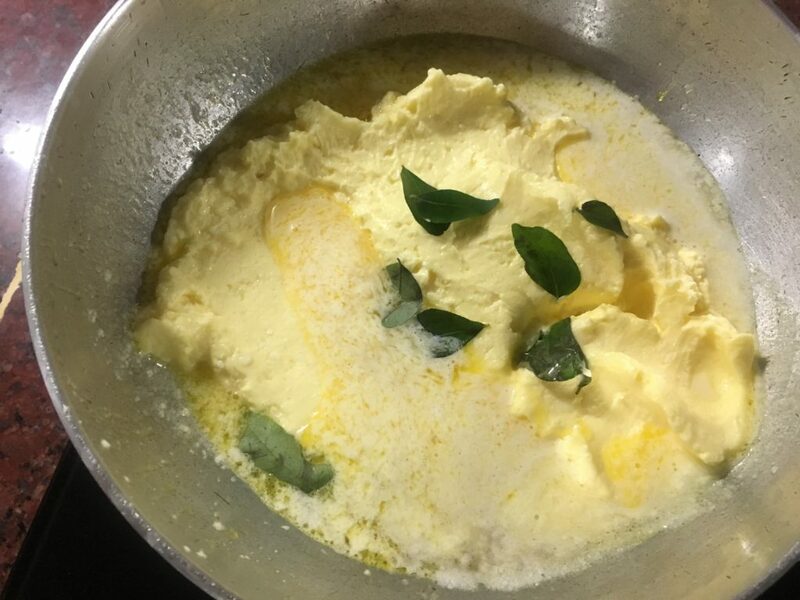 I store the cream in the fridge for about 10-15 days and then use it to make ghee. The cream stays good for that long in the fridge. I transfer all the cream to a deep vessel and add a couple of tablespoons of curd to it. I allow the cream to ferment for more than a day in the Bangalore weather. In more warm places like Mumbai or elsewhere, keeping the cream overnight for fermentation should be good enough, is my guess. 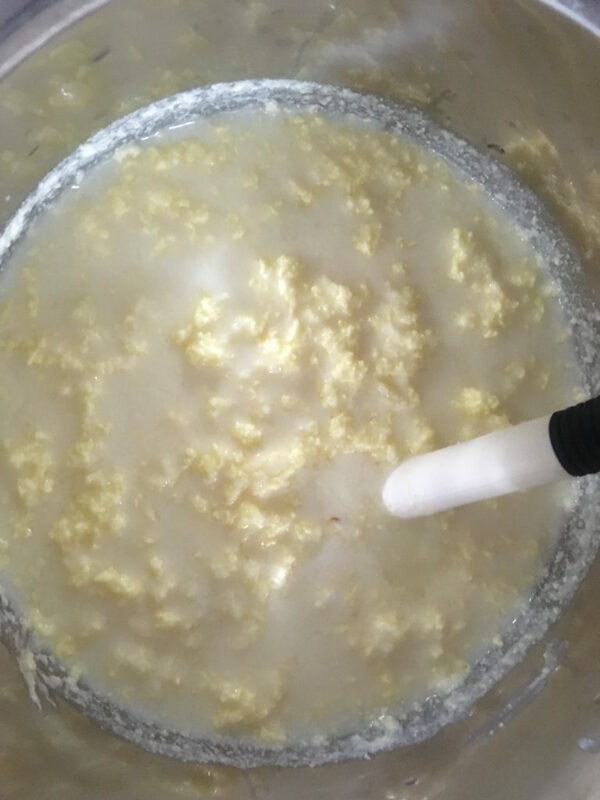 Once the cream is fermented and ready for churning, add ample of water (cold water preferred) to help with the churning. The churning process with the butter churner takes about 15-20 minutes for me. Once the butter starts floating in the vessel, transfer it to a kadhai and wash it with water a couple of times to get rid of the buttermilk. This apparently helps in getting good quantities of ghee! 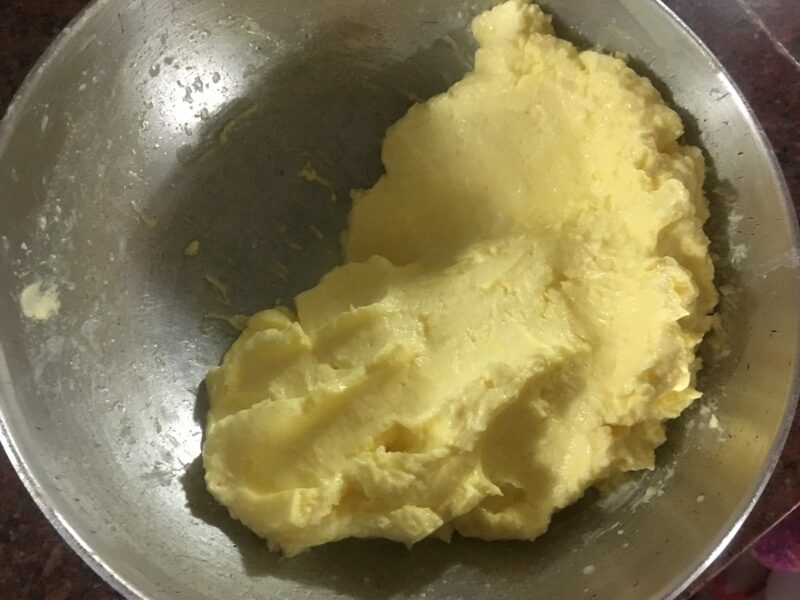 Once the butter has completely melted, keep an eye out on the ghee so that the sediment which is formed at the base of the kadhai is not burnt. The sediment, ideally, should be light brown in colour. We call it 'beri' in Marathi and it is usually eaten with sugar added to it. Yumm yumm! Once the beri starts browning a bit, quickly take the ghee off the heat and allow the beri to settle down. Strain the ghee using a strainer into a dry, clean jar. 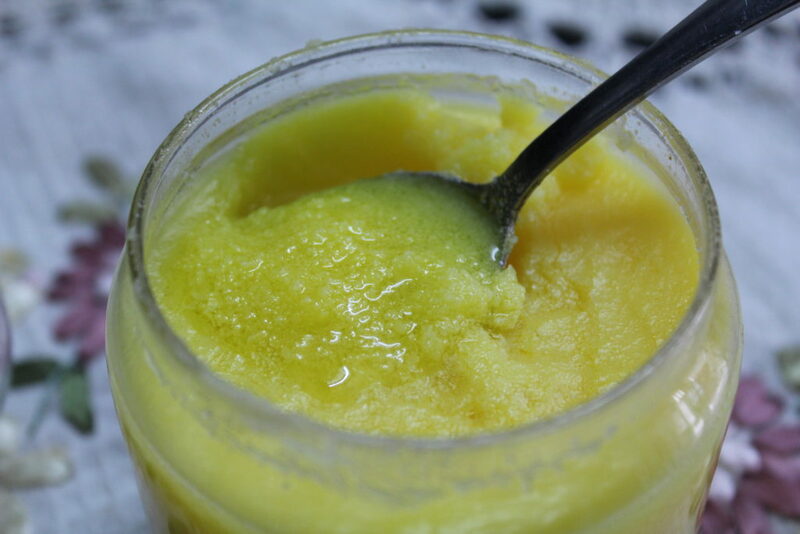 Ghee need not be refrigerated and can be stored at room temperature for years at times without it going bad.